Dave “D.B.” Mueller , a private pilot, has had a passion for aviation and art since being a young boy. Always sketching with pencil, it wasn’t until attending the Reno Air Races for the first time in 1992 that he knew he had to try painting in order to capture the brilliant colors of the air racers. Self-taught, many of his paintings went on to be selected for numerous international art exhibitions, with six receiving top honors. 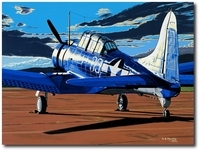 Paintings include art work on the movie poster for the 2004 film Flight of The Phoenix, the Rolls Royce Heritage Trophy emblem, multiple airshow posters, and the official 50th Anniversary painting of the Lockheed U-2, now on permanent display at Beale AFB. Dave has also worked with several Air Race teams over the years, leading fundraising efforts with the sale of limited edition prints and raffles of original paintings. 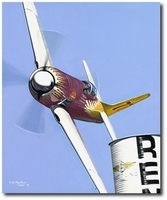 He was also selected as the artist for the official posters of 2010 and 2011 Reno Air Races. 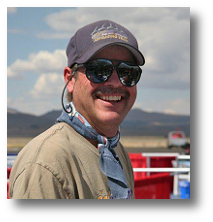 Dave and his wife Krista reside in Park City, UT, where he paints full-time and volunteers on the restoration of a WWII bomber, the Lockheed PV-2 Harpoon, Attu Warrior.